This morning a Black Legion Nyx died to the hands of N3PL. Earlier today Black legion managed to capture a station system off The Kadeshi. While BL was onlining TCU´s PL decided to make a play for it and jumped in a slowcat fleet on the station grid. The Station was quickly called primary and drones where unleashed, flipping the station several minutes later. Black Legion noticed what was going on and quickly formed a super fleet and a Maelstrom fleet as support. While forming PL managed to flip the station and warped to a BL POS to begin to reinforce it. BL realised this and thought it would be a good moment to capitalise on the opportunity to kill PL slowcats so they jumped in. PL saw the BL supers and quickly poked EMP members to come in and bubble the supers while NCDOT logged in. EMP managed to tackle all supers but BL started to see the troubles laying ahead of them so they began approaching the POS shields. NCDOT jumped in and quickly found their primary to be Elo Span in a nyx (Elo Knights super) who was facing the opposite direction to the POS shields. In an attempt to save the super BL jumped in triage which either quickly died to the damage of the N3PL forces here, or managed to safely make it back into the shields even though a collection of titans had been brought in, in an attempt to DD them off field. 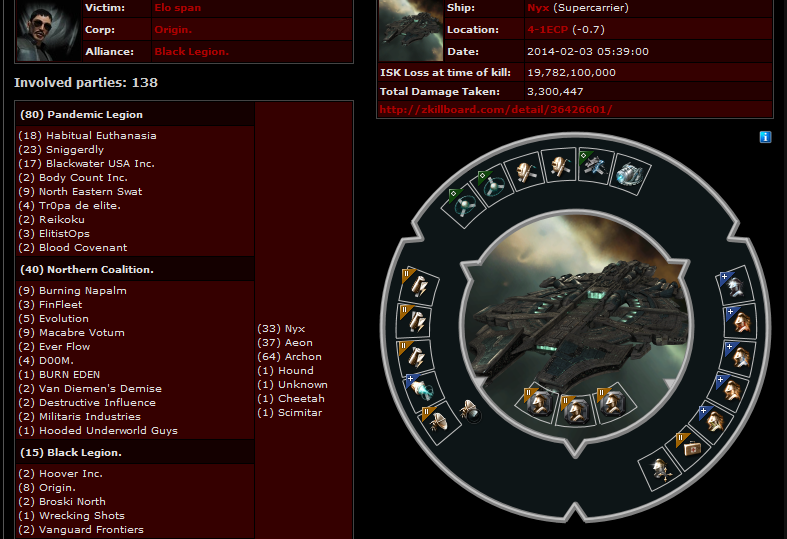 After BL lost their nyx and everything was safe inside a POS they decided to call it quits and returned home. Therefore shortly after RFing the POS N3PL destroyed the BL TCUs before returning to their staging systems. I would like to thank Manny from PL for giving us a complete rundown of what happened. plainly do not know about. You managed to hit the nail upon the top and defined out the whole thing without having side-effects , people could take a signal. fvL2OY Wonderful post! We are linking to this great content on our site. Keep up the good writing. KaISwQ Wow, incredible blog structure! How long have you been running a blog for? you make running a blog glance easy. The total look of your web site is magnificent, let alone the content material!